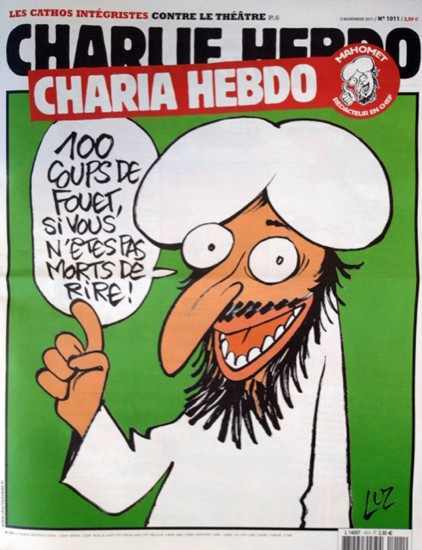 In simple solidarity with the editors of Charlie Hebdo, a French humor magazine that was firebombed yesterday for daring to poke fun at the sacred superman of Islam, I thought it fitting to share the offending front page feature that led to this act of terrorism and intimidation. It’s time for you followers of Mr. Mohammed to figure out just what century you’re really living in. Get the sanctimonious sticks out of your medieval butts, already! 100 Lashes if You Don’t Die Laughing! This entry was posted in Political/Social and tagged Charlie Hebdo, firebombing, Mohammed. Bookmark the permalink. “…medieval butts” Ha ha ha ha! Agreed. And unfortunately, too many of those horses’ patoots run the show.